The ultrafast Thunderbolt port is finally making its way to Windows 7 PCs and notebooks. Originally released for the 2011 refresh of MacBook Pros and Airs, Intel announced at IDF 2011 its plans to bring the lightning-speed port for non-Mac users to enjoy. Unfortunately, Intel vice president of PC Client Group Mooly Eden did not reveal an exact release window for Thunderbolt-equipped notebooks, but we expect a 2012 launch to be more likely. 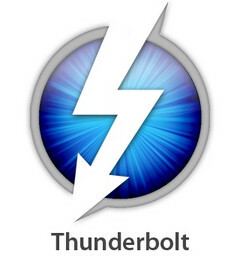 TechSpot is even predicting Thunderbolt to follow-up or launch simultaneously with the Ivy Bridge chipsets next year. The closest notebook PC with a Thunderbolt port would be the recently released Sony VPC-Z21Q9E/B, which actually uses Thunderbolt technology for its high-speed proprietary docking port. As of this writing, not too many devices make use of the Thunderbolt interface to its fullest. Especially with USB 3.0 becoming more common, it would be interesting to see how the Thunderbolt port will fare in the PC market.